The upcoming Strikeforce World Grand Prix — Heavyweight Tournament will take action on Saturday, February 12, at 10pm ET/PT, and will air live on Showtime. 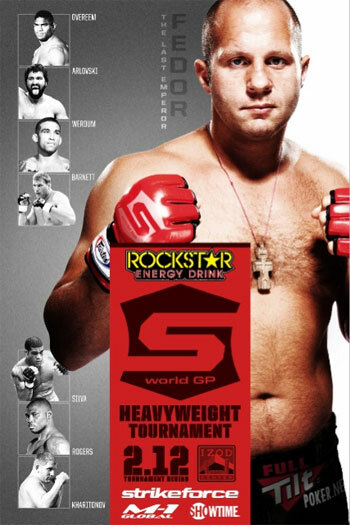 The event will feature two quarterfinal bouts between Fedor Emelianenko vs Antonio Silva and Alistair Overeem vs Sergei Kharitonov. The match-up will take place at the IZOD Center in East Rutherford, New Jersey. The other two quarterfinal match will feature Overeem vs Fabricio Werdum and Brett Rogers vs Josh Barnett on a site and date yet to be announced. Were you at the Strikeforce Grand Prix Fan Experience last Tuesday? Why not share your happenings by leaving a comment?